Our bodies host a large number of types of beneficial bacteria that are essential for the proper functioning of the immune system and the digestive system. The presence of these bacteria reduces the presence of pathogenic bacteria, which weaken and harm our bodies. When our bodies lack sufficient defensive bacteria, we can become prone to a wide range of medical conditions. This is where probiotics can be so vital for our health. Scientific studies link the use of probiotics to the resolution of a variety of problems such as: allergies, bacterial infections, constipation, diarrhea (including antibiotic-caused diarrhea), irritable bowel syndrome, vaginal yeast infections, and more. In fact, for people with a poor balance of good and bad bacteria, the use of probiotics is essential for the proper functioning of the body and its immune system. It should be noted that this is so especially for those living the typical Western lifestyle, which tends to encourage the kind of diet and sedentary behavior that harms the proper balance between beneficial and deleterious bacteria. 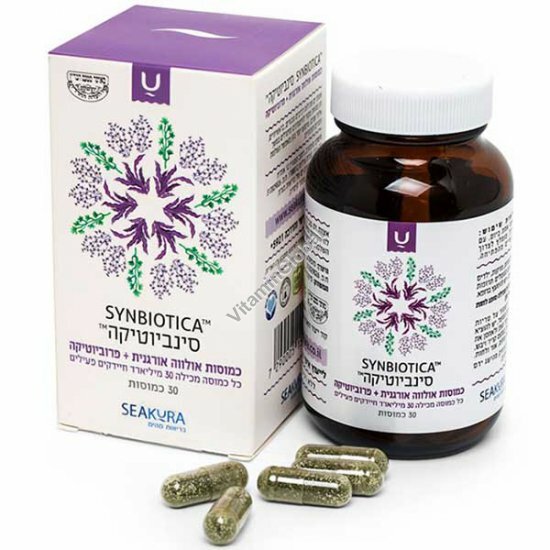 Synbiotics is a highly advanced nutritional supplement that combines 30 billion active probiotic bacteria with a natural prebiotic: a seaweed known as sea lettuce (Ulva lactuca) containing dietary fibers that, via digestion, provide the nutrients that good bacteria thrive on. This is an ideal formulation because, as confirmed by numerous studies, a combination of the two has a higher potential to induce real effects in treating health conditions than probiotics or prebiotics provided separately. In fact, a combination of both elements induces a synergistic activity whereby the probiotic bacteria in the capsule themselves thrive better, and not just the local beneficial bacteria, whence the term 'synbiotics' for any food or supplement that has both pro- and prebiotics. Ingredients: Ulva lactuca, L. Reuteri, L. Planterum, B. Longum, L. Acidophilus, B. Lactis, L. Rhamnosus, L. Casei, B. Bifidum, magnesium stearate (as stabilizer); Capsule: hydroxypropyl methylcellulose. Directions: 1 capsule a day, with food. Pregnant women, nursing mothers, people taking prescription drugs and children - consult your doctor. This information is neither medical nor indicative. In case of a medical problem, contact your physician.